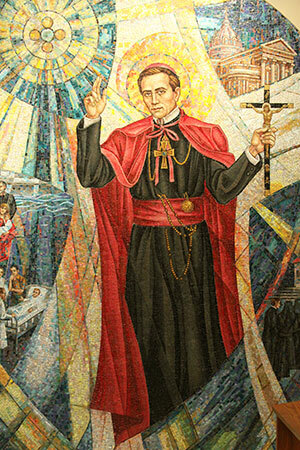 With Catholic eyes turning toward Philadelphia and the World Meeting of Families this week, we are seeing St. John Neumann and his Shrine getting plenty of media attention. EWTN is airing a new hour-long documentary on St. John Neumann. It was produced by a Czech film crew in conjunction with EWTN. Many scenes were shot in our Shore Road archives and at St. Peter’s in Philadelphia. Our archivist, Dr. Patrick Hayes, is a featured commentator throughout the film, and Father Matthew Allman shows up to say a few words here and there as well. The program will be broadcast tonight, Monday, Sept. 21, at 11 p.m. and on Saturday, Sept. 26, at 6 p.m.
St. John Neumann and St. Peter’s also get some airtime in a new documentary airing this week in Philadelphia on channel 6 ABC. The film is a whirlwind tour through more than 200 years of the American Catholic experience, particularly as it has been lived in the church of Philadelphia. In addition to its debut as part of the World Meeting of Families Film Festival at the Kimmel Center on Wednesday night, Urban Trinity: The Story of Catholic Philadelphia, will also be broadcast in three parts at 7 p.m. Tuesday, Sept. 22 (parts one and two), and midnight Sunday, Sept. 27 (part three). Once the film has been broadcast, it should be available online. For more information, visit urbantrinityfilm.com. Father Allman appears as a commentator in the film, and some of the vestments from our archives were used in the reenactment of St. John Neumann’s consecration as bishop. In preparation for the World Meeting of Families, The Faithful Traveler, another EWTN program, has produced a number of brief videos promoting Philadelphia’s shrine churches. These videos are being shown at local hotels and in other venues to introduce pilgrims to the various Catholic sites the city has to offer. Click to view their YouTube video on the National Shrine of St. John Neumann. All of these videos were produced before or during the Shrine’s renovation, so they can’t highlight the renewed beauty of the lower church. If you want to see what the Shrine is looking like now that it is in its nearly fully complete state, check out the photo gallery on the Shrine website. You can get an extensive tour through the whole renovation process by viewing the St. John Neumann Shrine Renovation Project 2015 album on the Shrine’s Facebook page. There’s also a 360-degree panorama of the renovated Shrine available for viewing here. Last, but not least, the Shrine and St. John Neumann were featured this Sunday in a piece published by the Philadelphia Inquirer. Father Raymond Collins is quoted throughout.